EASY TONE. On this workshop we are researching the basic things: support of the earth, easy fluid movement, using support of the partner, offering support to our partner. And doing this all as efficiently as possible with an easy tone. Variations in tone is preferable, how ever, often we are using much more tone and tension than we really need. We are using the outer muscles instead of the inner ones, and that is making us easily tired and heavy. In this workshop we are looking for a low tone, but not relaxed. How to let the energy flow through ourselves instead of making it. OTTO AKKANEN is a dance artist, photographer, bodywork practitioner, and teacher. 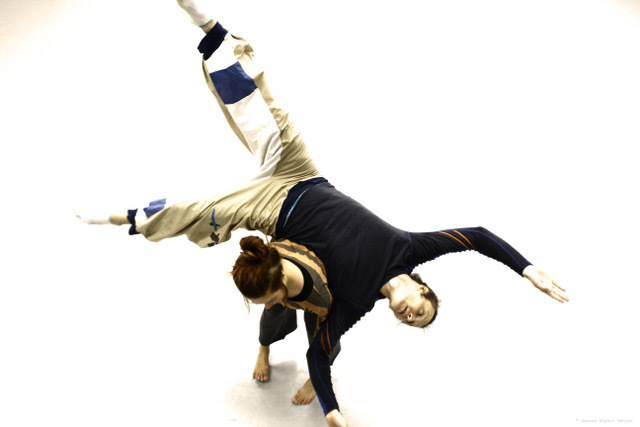 He was introduced to contact improvisation and contemporary dance in his twenties, becoming so involved that he went to study dance for three years, graduating from the vocational school of Outokumpu, Finland. He works as an artist performing solo works, and with different improvisation groups, choreographers, and video makers. As a teacher he has been working in Eastern and Central Europe, South America and Asia, and has been on the organizational and teaching team for Skiing on Skin – a large and diverse improvisation festival in southern Finland since 2008. In his teaching he emphasizes tactile sensory perception as a point of reference and learning. His interests revolve around power and hierarchies, politics, structures, language and the relationships between beings, ideas, and categories. He works as a teaching assistant for the ‘Piecemaker Software’ for current students of MA CoDE, holds a BA in Social Work (2001) and an MA in Contemporary Dance Education (2015). great event! is there any event like that in next year? Is there any workshop like this in 2019?